'We Don't Planet' Episode 3: What's Up with Gravitational Lensing? 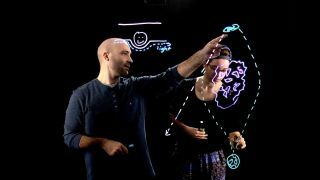 Paul Sutter and Anna Voelker discuss gravitational lensing during Episode 3 of the astrophysics-video series "We Don’t Planet." The fundamental description of gravity under general relativity — that the presence of matter and energy deforms the fabric of space-time, and this deformation influences the motion of other objects — leads to a rather unexpected result: a massive object can act like a lens, magnifying and warping the images of background objects. This prediction was the first major test of general relativity, with Sir Arthur Eddington leading an expedition to measure the small (but detectable) deflection of starlight around our sun, and today this facet of our universe is used as a powerful cosmological probe. The challenge that gravitational lensing answers is the determination of mass at very large scales. Since most of the mass of the universe is composed of dark matter, we can only rely on indirect probes to measure the true mass of galaxies and clusters of galaxies. Since gravitational lensing works with any kind of matter (dark or luminous or otherwise), we can use the distortion of images of background galaxies to directly measure mass, giving us a completely independent probe of dark matter. We can even go one step further: by combining multiple lensed images in and around a massive object, we can probe the interior distribution of matter. So not only can we measure total mass, but rather accurately determine where the matter is located in an extended structure. "We Don’t Planet" is hosted by Ohio State University astrophysicist and COSI chief scientist Paul Sutterwith undergraduate student Anna Voelker. Produced by Doug Dangler, ASC Technology Services. Supported by The Ohio State University Department of Astronomyand Center for Cosmology and AstroParticle Physics. You can follow Paul on Twitterand Facebook.